The Arctic Sport™ is the ideal snow boot. 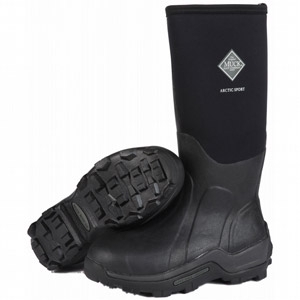 Let's face it, snow doesn't always stay frozen, so you need waterproof, insulated winter boots. Stretch-fit top line binding snug leg to keep warmth in and cold out. 5mm CR flex-foam bootie with four-way stretch nylon. 100% waterproof, lightweight and flexible. Arctic Sport Mid-cut is available in Hot Pink, Purple, Black/Maroon and Chocolate/Dusty Pink. Unlike traditional pac boots, the Arctic Sport™ features full-bootie neoprene construction that's 100% waterproof. Plus it has a premium fleece plus breathable Airmesh™ lining throughout - and a supportive, contoured footbed. Full-perimeter rubber reinforcements offer added protection for a variety of climates, water and snow conditions. Preferred for Arctic expeditions, snowmobiling, ice fishing, sleigh riding and other winter activities. Comfort range of -40° F to 60°F.